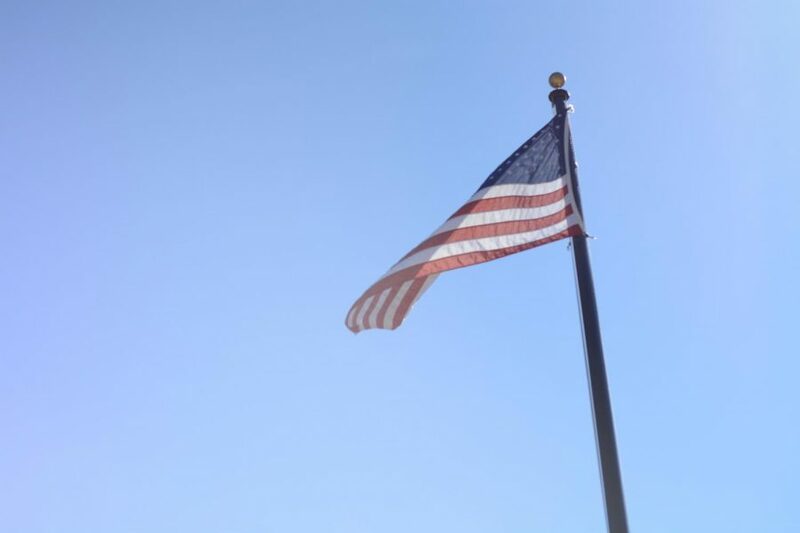 The flag outside Westford Academy. In the previous installment of this budget series, we discussed some of the how and the why of Westford’s school budget crunch. Now we break down the state aid formula, or money the state gives to make sure Massachusetts schools function at a minimum level, and outline all the ways in which it falls short. Westford-specific factors like a high student population, a middle-income status, and low property taxes certainly help shape the budget to be in the state that it is. However, an outdated and lackluster state aid means that across Massachusetts, towns face a pressure to make ends meet that is not being compensated as it should be by the state budget. Every district in Massachusetts funds its annual budget in two ways: from its own revenue and from state aid. The state’s contribution to education funding is determined by a piece of legislature known as the Chapter 70 Formula, which was formed in 1993 as a part of the Education Reform Act. The formula designates a foundation budget that should cover that base quality of education and then calculates how much the town can provide based on its wealth and revenue and fills in the difference with state aid. In FY20, Westford received $17,095,695 from Chapter 70 aid and the total school budget (excluding healthcare and retirement costs for faculty) was $60,627,268, meaning that Chapter 70 aid only accounted for 28.12% of Westford’s school budget. Its foundation budget was $45,124,999, meaning that Westford has to spend much more than the state has calculated in order to keep its school system running. However, as costs rise in school districts statewide and revenues fail to keep up, the state aid formula has remained fairly stagnant. Between FY19 and FY20, the Chapter 70 state aid increased by 0.6%, while the school budget rose 2.81% after the budget cuts. School Committee member Gloria Miller points to a report titled “Building an Education System that Works for Everyone: Funding Reforms to Help All Our Children Thrive” by Colin Jones, a Senior Policy Analyst at the Massachusetts Budget and Policy Center, that outlines the issues with the Chapter 70 Formula. According to the report, in FY17 school districts spent $2.46 billion more than their Chapter 70 requirements in total across the state. The median percentage above the requirement was 29%, meaning that 29% of the education funding had to be drawn from other aspects of the town budget. A graph from the report displays the excess spending Mass. districts do to meet school needs. 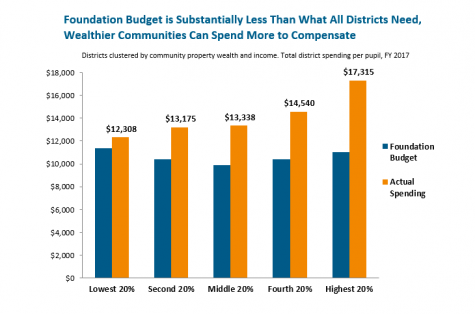 The Massachusetts Budget and Policy Member designates Westford as a middle-income town in the third quintile (40th-60th percentile) of wealth. 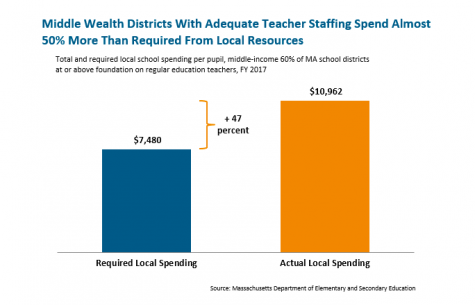 Jones’ report found that all quintiles spent more money on regular education teachers than the foundation budget, but this difference increased with the wealth quintile, as wealthier towns can afford to spend more. Middle-income towns spend almost 50% more than they should be paying from local resources when they have an “adequate” amount of staffing, says the report. A graph from the report details issues middle-income districts face with staffing. It is this dilemma that Westford faces now: it can no longer fill in the difference to the extent that it used to because of a lack of revenue, rising costs, and a state aid formula which does not compensate. As such, the town has to cut from the school budget in order to maintain a balanced town budget. There are four main shortcomings with the current state aid formula, says Miller. It does not fund adequately for employee healthcare costs, low-income communities, English-language learning programs, and special education. According to Town Manager Jodi Ross, healthcare costs for district employees take up 10% of the school budget. This year, the costs only rose by 0.6%, but can sometimes make much larger jumps, rising an average of seven to eight percent each year. While the town encourages employees to use the healthcare plans of their spouses and regularly changes healthcare plans in order to optimize costs, costs always rise. “If [healthcare] goes up eight percent, and the whole budget can only go up a little over two and a half, how do I do it? It eats away our budget,” she said. The issues with low-income community funding do apply indirectly to Westford, according to Miller. “If we’re improving school districts in other towns, then there is less pressure on the in-migration into Westford because if people are happy with the education they are getting in their current town, they’re going to be less likely to be district-shopping and looking to move to a district like Westford,” she said. Special Education funding, however, has a notable impact on the Westford Public Schools. Superintendent Evrett Olsen recently proposed to push back school start times to 8:00 for Westford Academy and the middle schools in order to address students’ lack of sleep. This proposal would lead to a two-tiered bussing system as opposed to the three-tiered system in place with the current timings, and more busses and bus drivers would be required. According to Miller, the challenge is not funding for the extra busses, but funding for transportation for special education students. WPS has a strong special education program, but it has recently become more difficult to provide proper funding for it. Special education programs use an assumed enrollment system to estimate the number of students and fund for their needs. However, Westford’s numbers are always much higher due to the successful program. “We also have a very good reputation for having excellent special education services. So if you are a parent with a child who has special education needs, and you’re not happy with your current school district, you might be looking to move to us,” Miller said. The School Committee is hopeful that the start time proposal will be approved and implemented in the near future, but as of now the budget is not allowing it to happen. The School Committee is hoping to put in place during upcoming school years, but nothing is certain as of now. State aid, enrollment numbers, and more are all up in the air for the coming years. Read about how this situation is projected to unfold and the town and school system’s plans for the future of school spending in the final installment of our budget series.